I love N&S. This sounds like a wonderful story! I like how variations can really take off after one change in a story. I haven’t read a N&S one yet. I’ll have to keep this one in mind. Nice review, Rita! I enjoyed this book, too. It was my favorite of the two by Ms. Brasure, although I liked both. Thanks for sharing your thoughts in this review. Thank you Janet 🙂 I always think of you when I post something about North and South 🙂 I always wonder what your opinion is. Wonderful review, thanks, Rita! Every time I read one of your N & S posts I’m thinking I don’t read anywhere near enough variations on that beautiful story. You’ll say I’m obsessed with P & P (and you’d be 100% right, by the way 😀 ) but this one appeals to me even more because the early engagement and the chance to get to know each other better, without the stormy rows of the original novel, makes me think of all the P & P variations where Elizabeth gets an earlier peak into Mr Darcy’s good nature and they grow attached for all the right reasons. I’ll definitely read this book! Thank you Joana! This is the book I talked to you about a couple of months ago. I do think it’s one of the best, and definitely worth reading. There are so many similarities in the two relationships aren’t there? Darcy proposes to Elizabeth and is rejected, so is Thornton. In both cases, he has fallen in love with her first. Both have to prove that they really are good men at heart. Like Joana, I’m reminded of all the P&P variations where that animosity between hero and heroine doesn’t really get the chance to blossom and they come to a better understanding without it. North and South is my next audiobook so I may well be in the mood for some variations afterwards. Yes, they are very, very similar, I think that’s why I love them both so much! I’ve already seen the dramatisation (sigh!) and read the original, some years ago admittedly. Thought it was time to revisit it, especially when I got the chance to get the audiobook really cheaply and Juliet Stevenson is such a great narrator. I discovered recently that because I have particular editions of Jane Austen’s and Elizabeth Gaskell’s books on my Kindle, I can get the corresponding audiobook through my membership with Audible UK at a really good price, £2.99 or even less! The Kindle books don’t even have to be paid ones. I have all of Jane Austen’s and some of Elizabeth Gaskell’s as free Kindle books. I got the North and South audio for £2.99 – an audio lasting over 18 hours. Not bad value, is it? Those prices that I was offered worked out even cheaper than the price I have to pay for my Audible subscription credits. I get 24 audiobooks a year for around £4.60 each, so if I get the chance to buy an audiobooks I really want and it’s less than that, then I do. Don’t know if it works the same in other countries, though. Wonderful review. I am a huge N&S fan and will definitely have this on my TBR. This sounds like a fab book,Rita. I read Trudy’s A Heart for Milton and loved it,but I haven’t managed to read this one yet. I adore Gaskell’s writing. I had the pleasure of reading N&S for the first time some months ago and felt so happy to be doing so!! I knew the ending but I was so caught up with Gaskell’s choice of words that I was simply swept away and couldn’t wait read the final words given to John and Margaret. 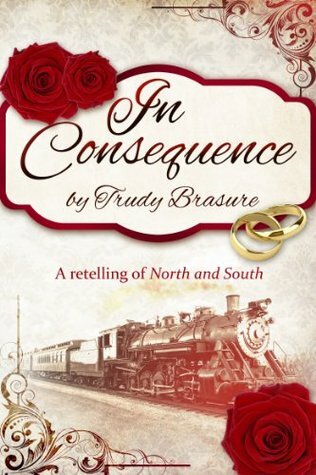 So I guess I must make time for In Consequence,as it sounds almost as good as the original! !